A Phillips-head screwdriver designed to maneuver hard to reach area. You’ll be amazed at all the additional uses you’ll find around the house for these handy tools! Now you can get into those hard to reach places that standard screwdrivers are too tall and awkward to maneuver at your machine. Plus each tool fits snugly in the attractive zippered case for easy storage and travel. 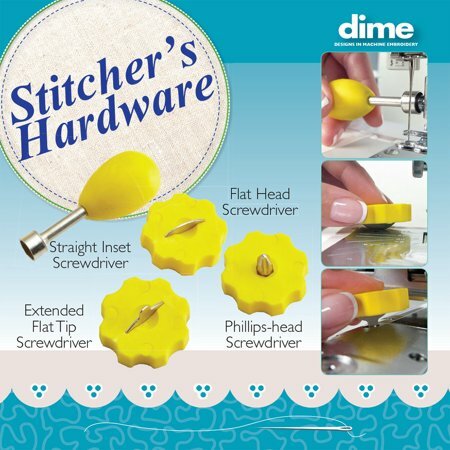 Designs in Machine Embroidery has slimmed down the basic screwdriver to its bare essential – the blade (flat head, extended flat tip and Phillips) and topped it off with an easy to maneuver wheel – just insert the blade into the screw and twist the dial to remove the screw. 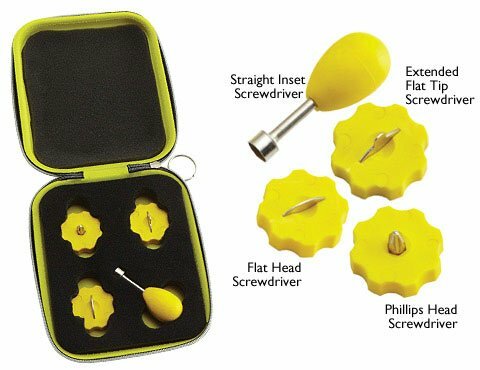 The straight inset screwdriver fits snugly over screws and has a great bulb-shaped handle that’s a cinch to keep hold of.